Last year I purchased the Santa from Kohl's after seeing it at Phyllis Around the House. You can find that post here. Phyllis has a beautiful blog filled with lots of eye candy. She hasn't posted for quite a while, I hope we can all entice her to come out of hiding. A few close ups of all Santa's details. I love your Santa, Lynne. I have at least 150 Santa's but not one chef Santa...I should do something about that! Your kitchen is beautiful. I am slowly getting around to finishing ours. It's always the last room on the list! I have a similar Santa! Your tree and all the goodies look delish!! Awww! He is a cute Santa! I am trying hard not to buy many sweets to have setting around, but this time of the year is hard. Really like the tree in the silver container. I think I remember this Santa...wasn't he on an incredible clearance? I miss Phyllis, too. 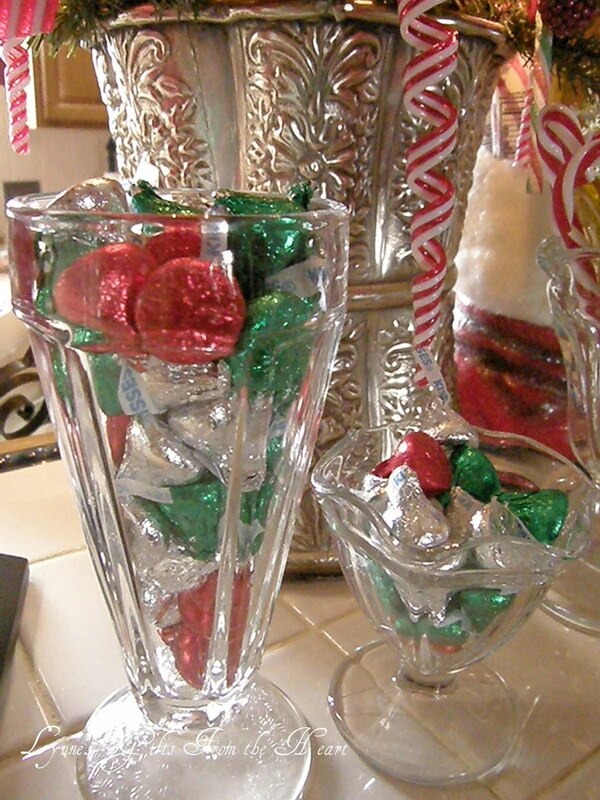 Your home is brimming with holiday decorations! I don't know how you do it. Everything looks beautiful, Lynn! I saw your name on Dot's post today and realized I hadn't visited in ages then realized I had somehow lost you on my Reader. So, here I am again and very glad. I forgot about my Chef Santa. I bought him last year at Kohl's as well, after seeing him her and on Phyllis's blog. I'm going to have to find where I stored him and get him into the kitchen. 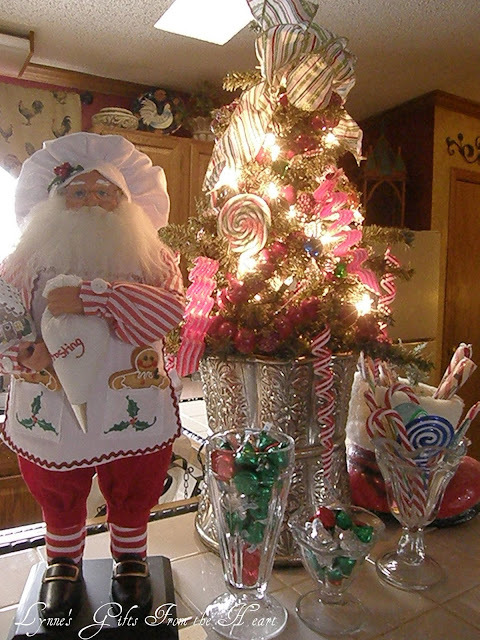 Love your Santa Chef decor. That silver vase is gorgeous. thanks for coming by and your sweet comment. Love that your kitchen looks like Candyland!! so cute!! I love shopping at Kohl's...... and I love your kitchen santa.....I love the candy stripe ribbon....Actually, I love everything I see! Oh my gosh, Lynne, I did a very similar arrangment on a corner of my kitchen counter! 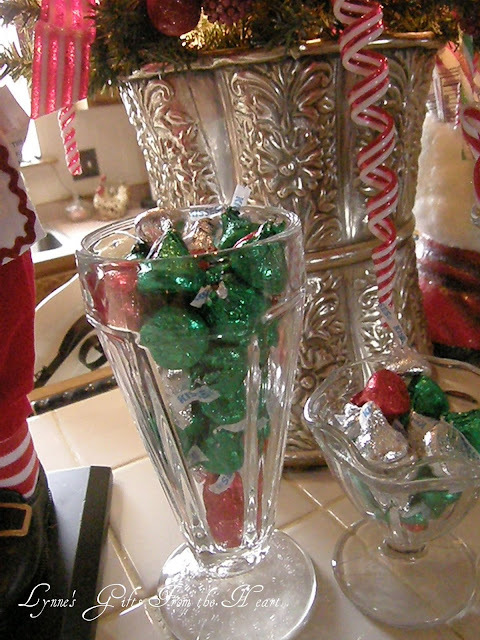 I also got that Santa after seeing it on Phyllis' blog! I miss her posts, she always posted such great pics from around her house. Yours looks great!